We have a shared bike parking and storage area in my apartment complex. We just got a note from the management company that thieves broke in and grabbed six bikes overnight! I was lucky not to be one of them, but I thought for sure cameras would keep them at bay. I fear my bike is going to be next – what can I do? I wish I could tell you that this was the first I’ve heard of this kind of situation, but it’s more common than you might expect. Over one third of all stolen bike reports 529 receives are from residences – private and shared garages, bike parkades and even from balconies! Never assume your bike is safe because there are physical barriers or cameras between it and the street. Garages are high on the list for bike thieves for a number of reasons. First, it’s often easy pickings – its rare for an owner, even in a shared parking space to lock their bikes. The outer door of the garage, and possibly cameras often give bike owners a false sense of security – “certainly no bike thief would go through the risk of being caught on camera or the hassle of getting through the big, heavy door, right?” Bike thieves are often very brazen – and a ski mask and black hoodie is generally enough to make even HD security cameras pretty useless (especially since garage cameras are often placed to capture vehicle movements and not human movements). Since most garages usually contain multiple bikes, they’re also a terrific place for thieves to “shop” – whether looking for the most expensive bike, or hauling multiple bikes in one visit. They’re also great places to “work” without detection – sometimes with a nice box of tools right within reach! Ask yourself – how likely is it that a quiet thief working in a private garage whose door was left open overnight going to get caught in the wee hours? 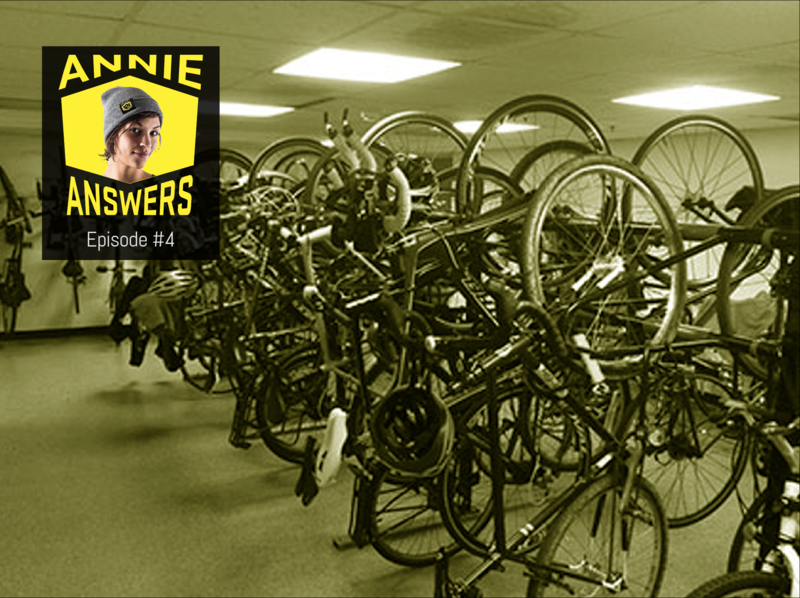 How often is your apartment complex’s bike room visited at 3am? Heck, many bike cages actually have a power outlet in them – providing 110V to power that angle grinder in the thief’s backpack. Bike cages in particular are frequented by organized thieves that we’ve seen haul as many as a dozen bikes in under 20 minutes! That can easily be $10-15,000 on the black market – not bad for an hours’ work. Fortunately, there’s a couple of things that you can do to defend your 2 wheeled chariot. The first is to always lock your bike when you aren’t riding it. This seems like a silly suggestion, but you’d be amazed at how often riders won’t take the 30 seconds to secure a bike in many situations. Even if you don’t have something solid to secure it to, at least disable the bike by locking one of the wheels to the frame. This will force the thief to carry the bike, or remove the lock with tools – adding inconvenience and risk of detection. Locking it to even a weak structure – like a table leg or fencing in a bike cage can add thieving time and might discourage the thief. For a home garage, definitely consider adding a security camera to your garage. You can work with a security company to install these, or look into DIY solutions like Nest and Drop cameras which are easy to install, have night vision capability, will send alerts to your phone and are accessible over the Internet from your smartphone. Simple signage or stickers that the garage is being monitored is not a terrible idea either. While most thieves are often pretty brazen, private garage theft is often more a crime of opportunity – a door left open overnight for example – so they’re likely to choose a non-camera alternative if one exists. Finally, you could also look into concrete floor anchors that you can use to lock the bike to the floor. For an indoor bike parking area in an apartment, condo or business, “think like a thief” and investigate the security around the bike cage and the access to it. Sadly, bike cages are often after-thoughts in these environments and add very little actual physical security. For example, in my apartment, I can access the bike cage with a coat hanger in under 15 seconds. Bring up your findings to your building manager and see what kind of response you get – give them a chance to surprise you and act on the information. Most police agencies and security companies offer CPTED audits for free or low cost to help an owner or property manager assess the weak points in their design and recommend improvements. If your initial attempts at encouraging your building to do a CPTED audit fail, consider reaching out to other cyclists and submit a formal group request in writing to your building management. Oftentimes the building management and the property developer are different folks and a CPTED audit may never have been done by either! Finally, make sure that you do your part. A lot of “garage”-like bike theft is the result of tailgating – where the thief follows a resident into the building or bike cage – either on foot or following a car through the gate. While it can make for an uncomfortable situation, challenge any person following you in by foot, car or bike to swipe their fob, press their garage button or otherwise introduce themselves. If they belong there, they will appreciate you doing your part to help keep the building secure and you might inspire them to increase their efforts as well.